Just the right mix of fun and functional! 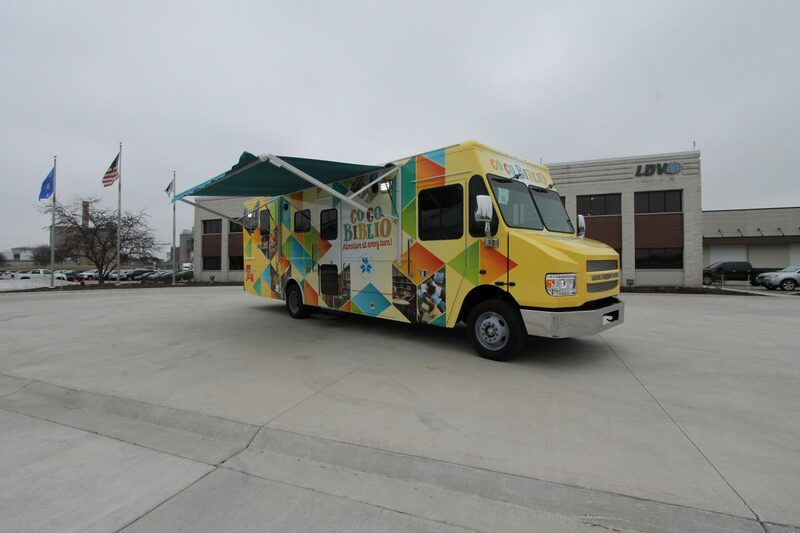 Lafayette Public Library's new custom bookmobile is built on a 22ft. Ford F59 chassis with Triton V10 gasoline power and an automatic transmission. The first thing you notice is the colorful, full-vehicle wrap and the brightly colored power awning. Lafayette selected a Braun electric-hydraulic power wheelchair lift for accessibility. Inside, Bostrom Pro-Ride Level II driver and passenger seats were selected. The seats swivel 180° to be used as the workstation/check-out desk seating which maximizes interior space. An integrated book drop with a hidden cart is built into the front workstation area which also has a flip-down counter section. Bright blue laminate countertops look great with the bright white powder coated Acore bookshelves and seal gray-colored book trucks. A full interior and exterior audio system was included in the truck with a PA microphone system as well. Tucked away in the rear storage closet is a microwave and refrigerator for convenience while out on the route. Power is supplied via Onan 7kW commercial generator housed within a custom-fabricated generator box.